There are post ideas swirling around in my head, all of which are influenced by my experience at IDEA World and BlogFest. Maybe you've been reading what my fellow bloggers are saying about this event? It's all good stuff, I promise. Today, I'd like to venture outside of the fitness component and talk a little bit about the blogging and social media tips I picked up. 1) You need to find your niche, which means you need to be yourself. Ask yourself what it is that you want to offer your readers. Or, ask them what they want! Then decide what makes your blog and/or social media channels different. The more specific you are with your content and your, the more engaged your target audience will be. In other words, be an influencer (not a blogger). 2) Become a content machine. And no, this does not mean that you need to churn out post after post in order to stay relevant. 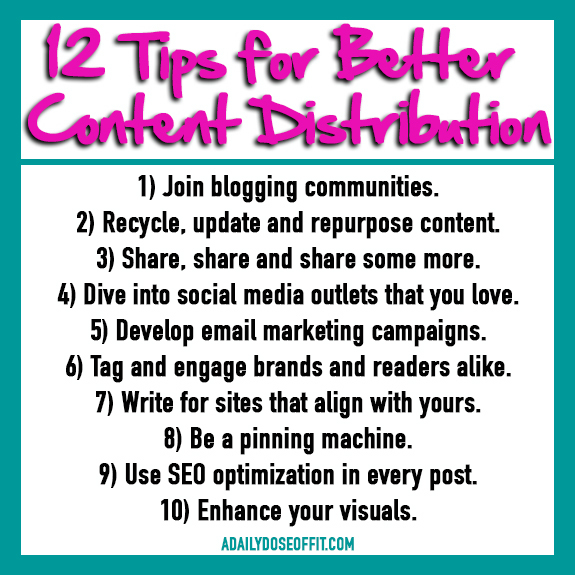 You just need to create content that lends itself to distribution. Hence, the shift from life casting to informative blogging (er, I mean influencing). And you need to distribute content. Yours and your blogging friends' content. Get out of your bubble and participate in the community. Support and you will be supported. Distribute and you will be distributed. 3) Get specific with Pinterest. It's really easy to get lost in all that is pinnable, but if you want to grow, you need to get organized. Create boards with specific names. Choose cover images that stand out and describe the content you're pinning. Additionally, consider which boards pop up above the fold (as in, which boards are visible when a user opens your page in their browser). Yes, you can rearrange. Always direct the images you upload to the right spot on your site, and when you create said images, consider making them long and skinny (which Pinterest happens to love). 4) Tell the truth. This goes without saying, right? We bloggers so easily fall into character, but we are human. And as such, we make mistakes. We're imperfect. Our readers know this, and they want us to say it. Why? Because that's what makes us relatable and trustworthy. 5) Blog posts should be at least 500 words. Google doesn't like anything shorter. Sure, it can be longer, but consider your audience's attention span. And to make every post count, you should research and use the right keywords. Again, what is your audience looking for? Google helps you with this in a number of different ways: You can use actual keyword tools, or simply do a search and see what Google suggests. And when you land on and use the keywords, be sure to apply them to your image descriptions and tags, too. This is all part of search engine optimization. It's confusing, but totally doable. Again, I could go on and on with all the blogging and social media tips that I learned at BlogFest, but there were a few that hit home. They seemed relevant and doable. Am I doing all of them? Not always, or not always the most efficiently. May this list help you, my fellow bloggers, and may it also help me continue growing this place I've created. Question: If you went to BlogFest, what's one tip you took away from the event? If you're not a blogger, what's one tip you (as a reader) would like to give us?